12 “deep dive” instructional webinar courses from Ben on all the aspects of setting up and launching your 10-Minute Workday “no-client” email business. SESSION 5 — “THE OPTIMUM OPT-IN PAGE” — AGAIN, A MODEL OF SIMPLICITY: ONE PAGE, A STRONG PROMISE, SOME LINES OF CREDIBILITY, AND AN ETHICAL “BRIBE.” BEN SHOWS YOU HOW TO PUT IT ALL TOGETHER — IN A DAY OR LESS. SESSION 6 — “SLACKER PROOF SALES LETTERS” — BEN’S VERY OWN, HIGHLY TESTED, EXTREMELY EFFECTIVE METHOD OF WRITING “NOT-SO-PERFECT” SALES LETTERS BROKEN DOWN INTO FIVE EASY STEPS. SESSION 7 — THE EMAIL PLAYERS CRASH COURSE — THE THREE-PART, IN-DEPTH TRAINING SESSION THAT TEACHES YOU HOW TO WRITE EDGY, ENGAGING, MEMORABLE, AND HIGHLY EFFECTIVE DAILY EMAILS JUST LIKE BEN — PLUS AN INVALUABLE 30-DAY “GET GREAT AT EMAIL” GAME PLAN. SESSION 12 — WRAPPING IT ALL UP — BEN’S TIPS FOR “GETTING IT DONE”… HOW TO STAY ON TRACK… AND WAYS TO MAKE SURE YOU’RE OPTIMIZING EVERY ASPECT OF THE 10-MINUTE WORKDAY PROGRAM SO YOU CAN START ENJOYING THE “10-MINUTE WORKDAY” LIFE AS QUICKLY AS POSSIBLE. So you see — it’s all here. 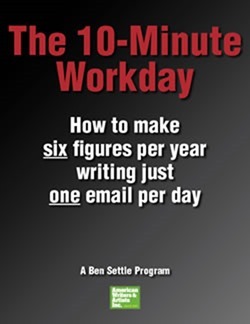 A “soup-to-nuts” strategy on how to build and launch your very own six-figure email copywriting business — modeled after Ben’s very own. And to make sure you don’t miss one single word of it — you’ll not only get access to each full webinar… but also an audio version… a transcript of all the sessions and printable versions of every webinar slide for easy “anytime” viewing. Naturally, Ben and AWAI want to give you everything you need to succeed — and then some. So we’ve assembled a very long line of special bonuses — interviews, essays, reports, and special learning tools designed to broaden your knowledge of the business and “drive home” the basic strategies you’ll need to know to be successful. Issue #1 — “How to Clear Six-Figures Per Year Writing a Couple of Emails Per Day”… an incredibly concise four-part recap of Ben’s highly successful email writing business model, with focus on how to build income streams… how to research your market… how to get all the “tactical” stuff right… and how Sean D’Souza’s “sequential selling” secret can virtually guarantee your success. Issue #2 — “The Cheapskate’s Guide to Using Just One Email Per Day to Build a Hotlist of Leads Eager to Buy From You” — Classic Ben, where he implores you to use his “12 simple strategies” for taking material you’ve already written and use them to grow your list by leaps and bounds! Plus, a few “bonus secrets” for growing your business. Issue #3 — Anatomy of a Mega Successful Product Launch Using Nothing But “Lowly” Emails — Ben’s incredibly simple four-step “A-D-S-D” strategy for creating a highly profitable launch sequence for any and all new products you decide to create — and all it takes is a strategically structured “10-Minute Email”! Issue #4 — How to Write, Produce, and Profit from Print Newsletters — Ben’s favorite way to turn your “10-Minute Email” business into a thriving success. Once you have your template (which Ben will give you), they’re easy and fast to produce… offer great value to your readers… come with a high profit margin… and can be “repurposed” in so many ways that can grow your business. Video Three: “A Lonely Place of Buying” — how focusing on this little addressed but powerful emotion you can not only win your reader’s loyalty, but you can use this unique “bond” to double, even triple your sales whenever you use this approach. As part of this “email bonus package,” Ben includes five (5) copyright-free email templates you can use and adapt for your own email business… however you choose! “Lost Tape” Interview #1 — Ben talks with copywriting legend Doug D’Anna about a secret not one in 1,000 writers knows: why a properly written “boring” headline will outperform “exciting” headlines a majority of the time.Also: why people don’t buy “benefits” (and what they buy instead)… the secret of making people want to buy from you and you only… What football legend Joe Montana can teach you about copywriting… how to constantly sell throughout your ad without even mentioning your product… and more! “Lost Tape” Interview #2 — One of the most successful and respected copywriters on the planet David Deutsch reveals his “Hey Mitch” secret for knowing if the copy you just wrote is “great copy” or not — without guessing or testing.Also: How to make “technical” facts about your product sound fun and fascinating… 4 things every copywriter MUST know about design… A secret “backdoor” way to break into the direct-mail industry… When you should NOT write in a smooth, “conversational” tone (and instead use stilted, boring “corporate speak”)… plus the “Copywriting Secret ‘A‐List’ Copywriters Privately Talk About with Each Other… But Almost Never Discuss Publicly”… and more. How to write moneymaking ads right out the gate — without needing any copywriting books, formulas, or Swipe Files. A scientifically proven way (recently discovered by neurologists) to transform your frustration with writing ads into boundless creative energy. A $13 book (not even about copywriting) that can teach you more about writing irresistible bullet points than most advanced copywriting seminars. Why tossing your order forms on the street can increase your response by as much as 30%. How to use your telephone to double your sales without doing any telemarketing or even dialing any numbers. An “almost foolproof” way of knowing if the market is going to respond to your ad before testing it or showing it to anyone. What Ken learned from corresponding with the late (great) copywriting genius Eugene Schwartz. How to create professional-looking Internet video ads on a “shoestring” budget. A single, “magic word” (often used with CNN newscasts) that will have your prospects glued to your ads — even with a hundred other ads competing for their attention. How the legendary copywriter Mel Martin wrote ads so powerful people would order from them without even knowing what the price was! Ben’s Classic Ads Swipe File — 101 “Copy Slacker” style ads that influenced Ben’s ad writing career… Classic newspaper ads and letters by the likes of Gary Halbert and John Carlton. In-depth video analysis on seven (7) of the most successful ads Ben’s ever written! There’s no better way to master Ben’s “Copy Slacker” ad writing techniques — learn the “method” in the course… and see it applied in black and white in this eye-opening expose! The Ultimate Ben Settle “Bullet Template” Guide — One of the “Ben Rules” for writing fast and effective sales pages promoting your product is extensive use of bullets. Because they’re crucial to the success of your sales promotions — those bullets must be great. To help you, Ben is sharing over 350 of his best “bullet templates” — actual copy you can modify and adapt to your own promotions. Ben’s Guide to “Letting Other People Handle the Boring Stuff” — as a “10- Minute Email” writer, your focus should be on two things: growing your list and selling through your emails. The last thing you want to be worried about is processing payments, sending out products, setting up websites, and any of the other “pedestrian” chores involved with the operational side of running a business. In this invaluable guide, Ben and AWAI show you how to “offload” all that stuff to other people — at a remarkably low cost. That way, all you’ll have to do is log onto a single website to see how many sales you’ve made — and rest comfortably knowing that when you make a sale, the product’s being sent to your buyer quickly and seamlessly.